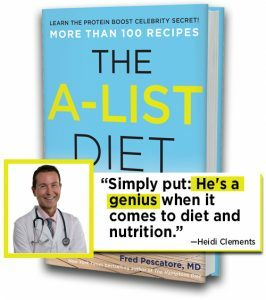 From best-selling author of The Hamptons Diet, Fred Pescatore, M.D. Update: Fun in the Sun! 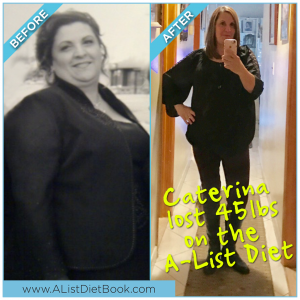 Caterina Prestano, a 56-year-old mom from New York, was convinced she’d never lose weight. She tried all the popular diet plans out there, and hadn’t had much — if any — success. So when I described my A-List Diet plan to her, she was understandably skeptical. She worried it would be like the other “boring and unmotivating” diets she’d tried. But she agreed to give it a shot. And even though The A-List Diet seemed similar in some ways to other diets she’d tried — her results were far from the same. She lost 10lbs in the first week and 20lbs in the first month. “To my surprise, adding amino acids did the trick,” she said. These days she’s currently down 45lbs and still losing weight. Not to mention—she feels great! Did it just in time for the Golden Globes! “My patient Amanda is a Golden Globe Award winner. She needed to lose about ten pounds before the 2015 Golden Globes ceremony, which took place shortly after the holidays. Amanda has been working with me for several years, but with all the pressure on her that year, she took partying to a new level in Punta del Este, Uruguay. She came to see me right before red carpet season. “Luckily, I knew how she usually ate, so all I needed to do was simply protein boost her diet, in addition to adjusting the proteins in her meals. From “Uh-Oh” to “AMAZING” in two weeks! “Melissa, a television and movie star I’m sure you know well since she’s constantly on the cover of magazines, had some medical issues. For one, she is perimenopausal, and that makes weight loss quite difficult. While many A-list actors slack off between roles, Melissa can’t because perimenopause doesn’t allow for that kind of leniency. “Melissa was about to do a role that required her to look fit but one where she needed to be taken seriously—something she might get nominated for. Time for the big guns. “Bottom line: Melissa needed a different protein booster shake than what she was taking, and she had fallen into a rut of eating too many acidic foods. I switched her to the shake for the Diet Challenged and recommended more of the alkalizing foods. Because of perimenopause, she needed to eat more fish, which has more essential fatty acids to help boost metabolism than white meat chicken does, and full-fat dairy. I encouraged her to eat more foods that contain lysine to promote collagen formation, such as nuts, seeds, and eggs, so her skin would look better—and to up the ante on the vegetables. Lost 10 pounds by Day 7! “Phase One of the A-List Diet is the part that A-listers like the best because the results are quick and easy. That said, Mike, a rap icon, almost cried when I explained it to him. I never expected such a reaction from such a macho guy. I reminded him that the Grammys were two weeks away and he would be very shirtless on stage. Lost 86 pounds and counting! “Marla, a fifty-four-year-old woman, came to see me because she was at least a hundred pounds overweight. She was diabetic and was unable to control her blood sugar, so her doctor put her on insulin. Marla hated insulin and told me that she would do anything to get off it. She was okay with taking nutritional supplements and even her diabetes medications, but the thought of insulin scared her. “After doing all the necessary blood work, we started with the detox program (see chapter 3) and then the perimenopausal program, with two protein boost shots per day and the specific protein booster shake. “This diet book teaches so much more than how to lose weight. I am learning what I never knew about the three groups of amino acids etc. and finally am going to have some variety in what I eat. This is great!! Plus all the stuff about how to choose meat in a store. Luckily, living in the year 2017 I can get all organic grass fed etc. etc. I have to say that this is much more than I expected. This is a layman’s medical education. So important right now when many people not only are not getting results from their regular doctors but our system simply does not pay attention to stopping or slowing disease before it gets to the acute care stage. This gives power to the patient to really make changes in their lives. It lets people take their health care into their own hands with more specifics about their individual genetics, age, etc. And consumers will be far better educated when they do have questions for their doctors. I am challenged by all of the information in this book and love learning about this stuff. I have to say, I didn’t think that any of it would really be helpful for me because I am probably 15 pounds underweight according to the BMI scale. But I am fascinated and it is so rich in information for me as well! IT’S LIKE I’M 25 YEARS YOUNGER! HIS PLAN JUST WORKS—I LOST 90 LBS! I’VE LOST OVER 25 POUNDS! I lost 35 pounds in 6 months! Down 12 pounds this week!